It’s our eighth birthday! The team have done a great job exploring the various ways the number eight connects to the Galaxy Zoo Universe and that collection of blogs does a brilliant job of illustrating the dramatic variety of places we’ve explored together. Some of them were familiar, but others we didn’t even dream of before the start of the project. An 8 for our 8th birthday! Once you start thinking about it, thinking of Galaxy Zoo as an exploration, as a journey undertaken as a group makes a lot of sense. Lots of you have joined us for the whole journey, as we’ve travelled further and further from familiar ground, while others – just as welcome – have walked only a little way. The science team, too, has grown as it has become apparent quite how much can be done with your classifications, and the whole grand parade has attracted a following of computer scientists, web developers and other assorted camp followers. I’m writing this on my way to report on the arrival of New Horizons at Pluto for the Sky at Night. For the first time, we’ll see close up images of a world that until now has been little more than a point of light. The missions is part of the glorious tradition of Solar System exploration, but our journey through the datasets provided by the Sloan Digital Sky Survey and by Hubble are voyages of exploration too. We need not travel to distant galaxies to understand them; encountering something new and never-before-seen in your web browser is thrill enough. Thanks for all the classifications of the last eight years – here’s to many more. One of the wonderful things we’ve been able to do with Galaxy Zoo over the years is to use the same site to classify many different types of images of the sky. These include surveys that come from a range of telescopes, both on the ground and in space, images at a range of wavelengths, and covering different areas of the sky. We need these different sets of images because they drive the wide variety of scientific questions that the science team studies using galaxy morphology. 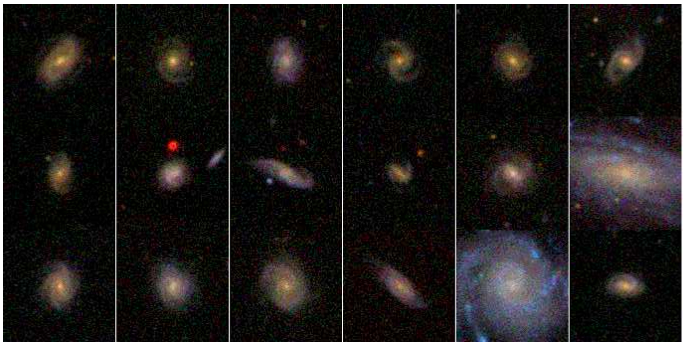 As part of our celebration of eight years of Galaxy Zoo, I wanted to highlight the different datasets we’ve been able to classify over the years. The bulk of the data used in both the original Galaxy Zoo and Galaxy Zoo 2 projects. These images were taken by the SDSS telescope, located in the mountains of New Mexico, and provided almost 900,000 individual galaxies that volunteers helped to classify. The Cosmological Evolution Survey (COSMOS) was a dedicated campaign to image the same 2-square-degree field of the sky with more than a dozen telescopes, from radio through X-ray. 86,314 images of galaxies in the COSMOS field taken with Hubble were classified as part of the Galaxy Zoo: Hubble project. Unbarred spiral galaxies from COSMOS and classified in GZ: Hubble. From Melvin et al. (2014). The Cosmic Assembly Near-Infrared Deep Extragalactic Legacy Survey (CANDELS) was the largest project in the history of Hubble, with the equivalent of more than four straight months of observing time. Using the near-infrared WFC3 camera, Hubble image some of the earliest massive galaxies, formed only 2-3 billion years after the Big Bang. 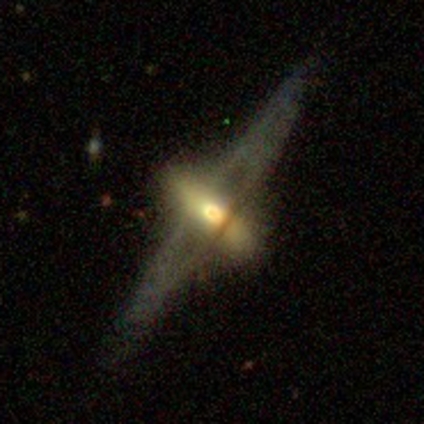 49,555 images from CANDELS were classified in Galaxy Zoo from 2012-2013. 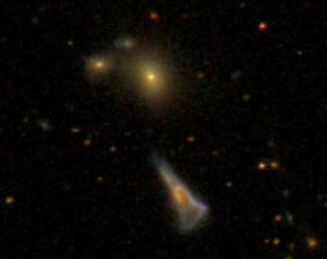 Disk galaxies in GZ:CANDELS, including those without bars (top row) and those with bars (bottom row). From Simmons et al. (2014). 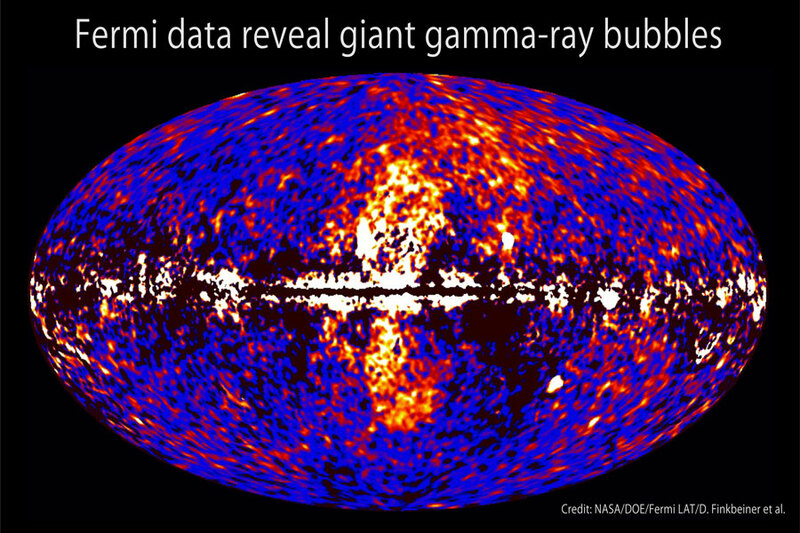 The United Kingdom Infrared Telescope, located near the summit of Mauna Kea in Hawai’i, carried out a large survey at infrared wavelengths, ranging from 1 to 3 microns. 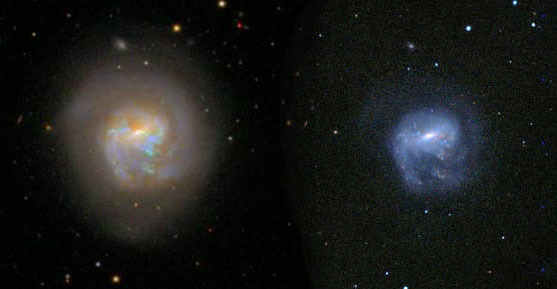 This survey (UKIDSS) allows us to compare morphologies of the same galaxies between optical and infrared, probing the effects of galactic dust and different stellar populations. 70,503 galaxies from UKIDSS have been classified by Galaxy Zoo volunteers. 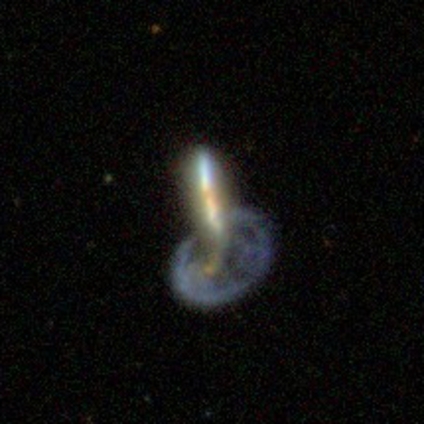 A spiral galaxy with dust lanes, seen in both the optical (SDSS; left) and the infrared (UKIDSS; right). 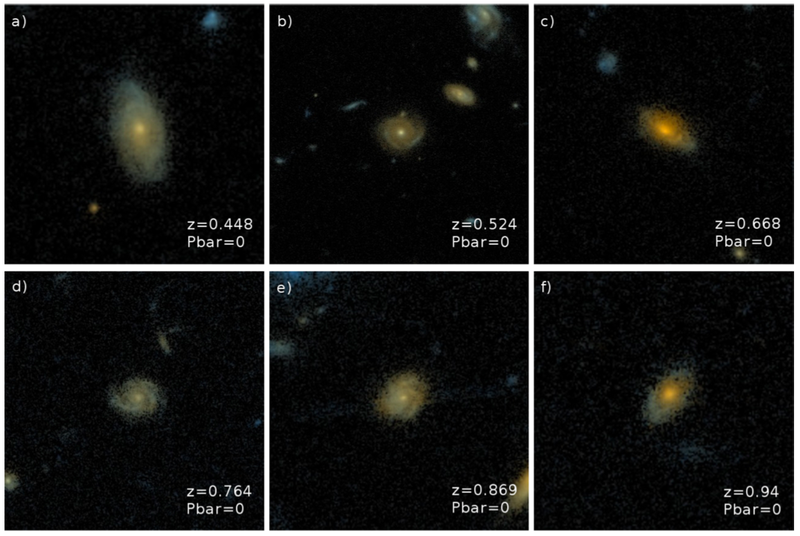 One of the critical issues with all Galaxy Zoo data has been calibration of the morphologies we measure, especially in distant galaxies where small and/or faint images can affect the accuracy of classifications. Using a piece of software called FERENGI, we artificially processed SDSS images to make them appear as if they were much further away, and we’re using those classifications to calibrate the data from Hubble. This included 6,624 images of galaxies at a range of distances and brightnesses. 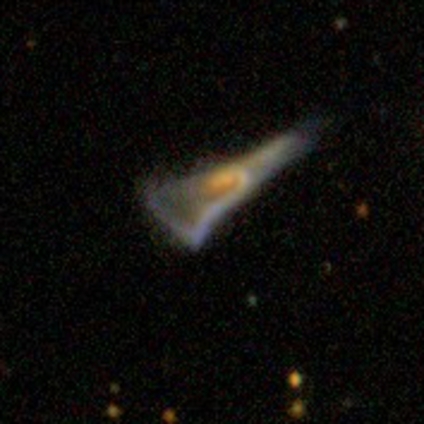 An SDSS image of a barred spiral, artificially processed to appear as if it were at a variety of distances. The Great Observatories Origins Deep Survey (GOODS) is another multi-wavelength survey of the sky, focusing on data from NASA’s flagship space telescopes of Hubble, Chandra, and Spitzer (plus others). 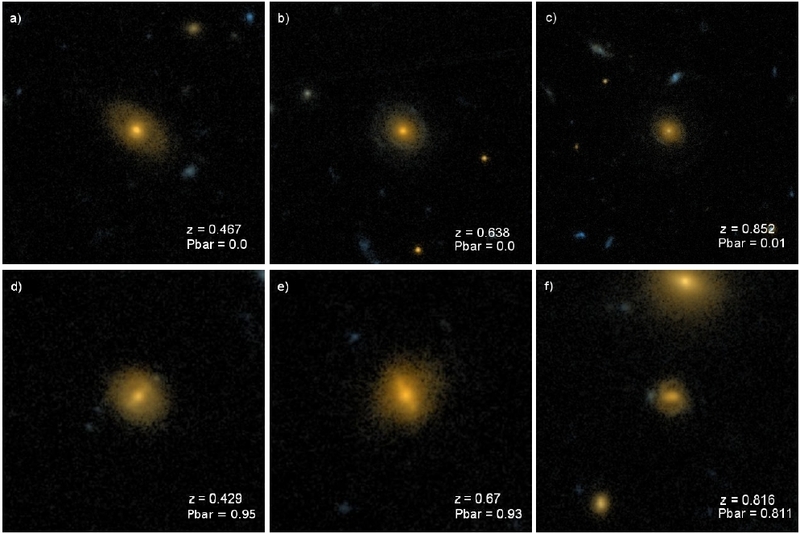 We not only study high-redshift galaxies using GOODS data in Galaxy Zoo, but also measure how increasing the sensitivity of the images can change the apparent morphology. 11,157 GOODS images have been classified in Galaxy Zoo at both shallow and deep imaging depths. 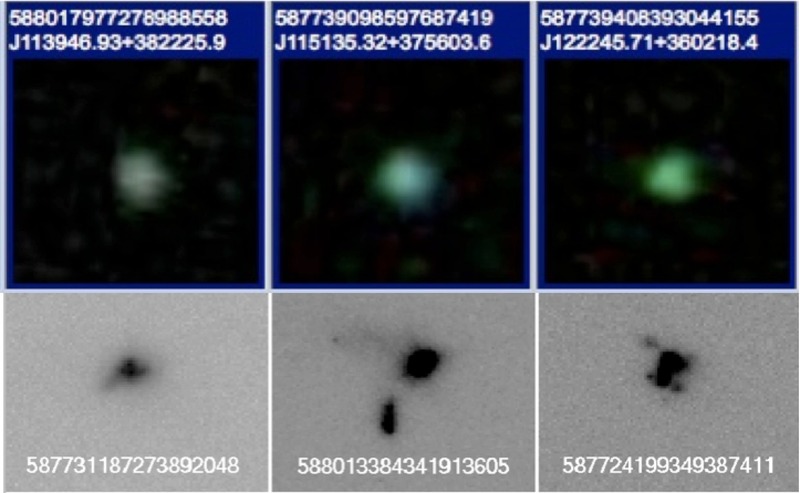 Comparison of the GOODS images classified in Galaxy Zoo. The left shows shallower images with only 2 sets of exposures; the right shows the deeper images with 5 sets of exposure. 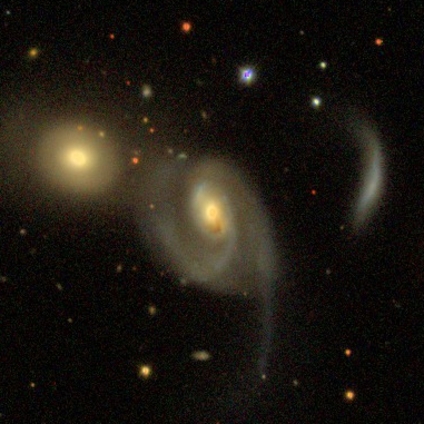 One of the very first Galaxy Zoo papers addressed a fundamental question: are spiral galaxies in the Universe more likely to spin clockwise, counterclockwise, or equally likely in both directions? To measure this, we used images of spiral galaxies that were artificially flipped, which helped us correct for a psychological bias in the human brain that exhibits a slight preference for counterclockwise spins. 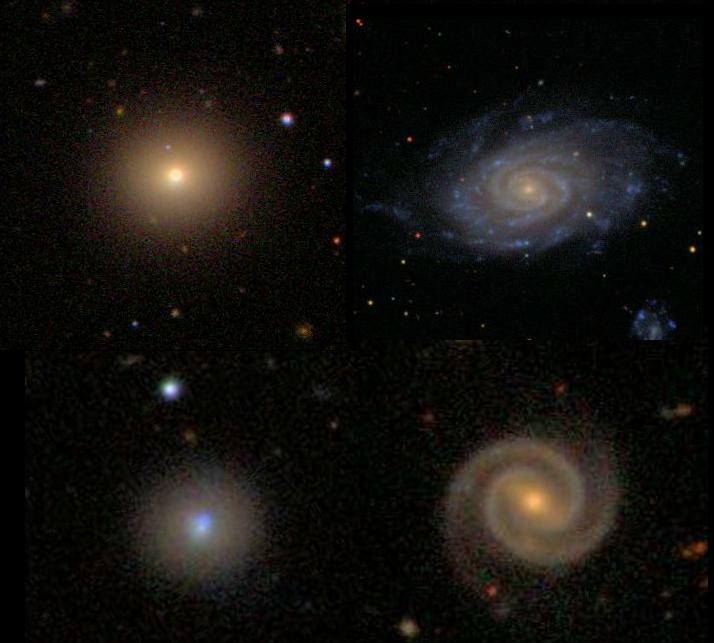 Images of four spiral galaxies, both as the originals (top) and horizontally flipped (bottom). 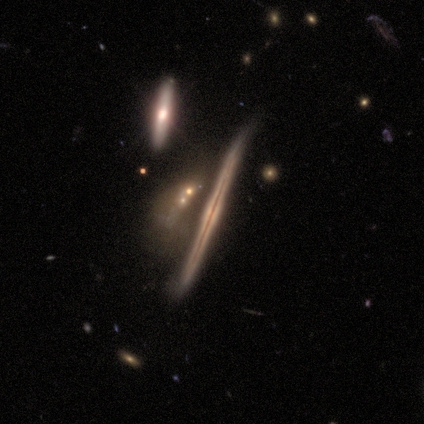 The latest new set of data used SDSS galaxies again. 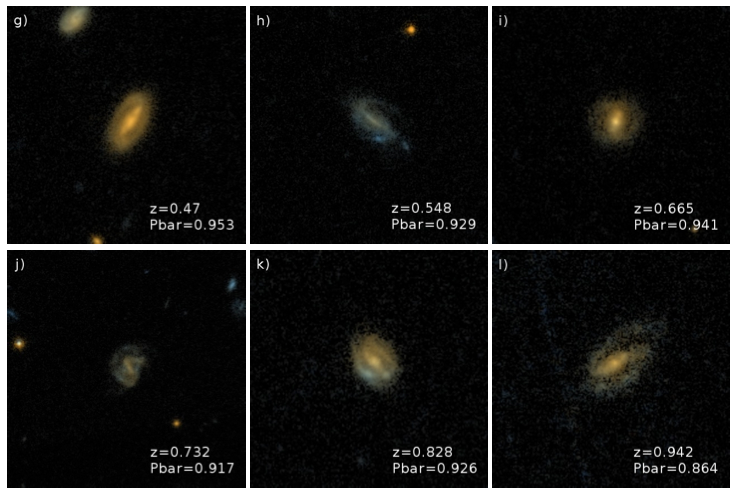 Instead of making the “color” images that we’ve used before, however, Galaxy Zoo volunteers were asked to classify images from the five individual filters in SDSS, spanning light from the near-ultraviolet to the near-infrared. This will allow us to better measure how morphology can change as a function of observing wavelength, and determine which physical processes in the galaxy are responsible for the light that defines how we measure the shapes. 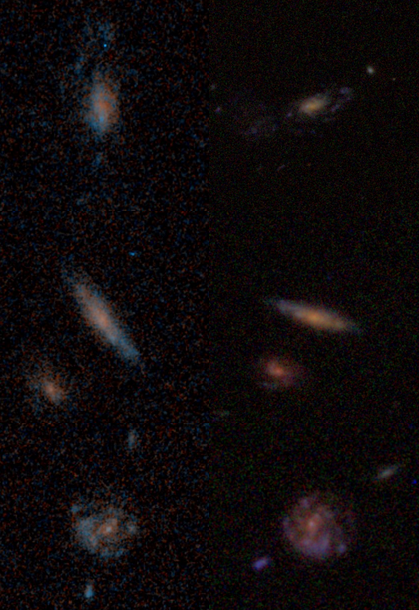 Single-band filter images of galaxies from the SDSS. More to come soon. Thanks again for all your help with what we’ve done so far!!! Continuing the countdown to Galaxy Zoo’s 8th birthday, below are 8 of the most-commented-on galaxies in the active Galaxy Zoo. They range near (in astronomical terms) and far, from gorgeous disks to space-warping groups, and some of them aren’t even galaxies at all! A lovely example of the diversity of structures in the Universe. The central galaxy may have been a perfectly symmetric spiral before it was seriously disturbed by the elliptical galaxy on the left side of the shot, and what’s that wispy thing off to the right? Is it a former part of the central galaxy? And what is this all going to look like in a few billion years? Whatever happens, the volunteers made it clear this is a special one to classify and to look at. 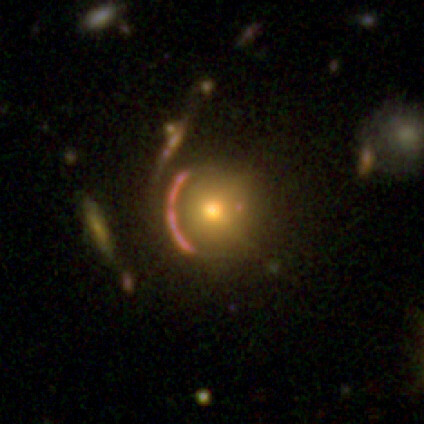 This gorgeous gravitational lens was spotted almost immediately upon the launch of the new Galaxy Zoo within the high-redshift CANDELS data. It generated multiple lively discussions and scientists and volunteers alike weighed in with further information. It turned out in this case that this was one of very few lenses that were already known, but there are likely still unknown lenses buried in the data, waiting to be discovered! Initially identified as a high-redshift star-forming galaxy by one of our seasoned volunteers, a number of people subsequently looked further into the existing scientific literature. 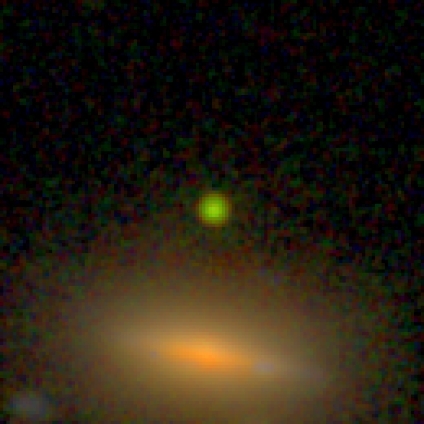 There was a lot of debate about this particular point of light, but in the end the volunteers uncovered a later paper confirming that this green gem (which would actually be either very red or nearly invisible to the human eye, as it’s “green” because it only shows up in the infrared filters used for this image) is actually just a star in our galaxy. Bummer, maybe, but this process is also an important part of science. 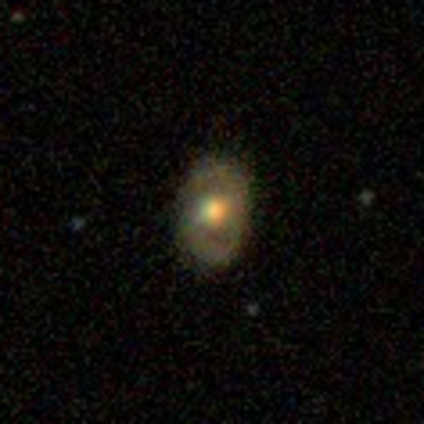 This spectacular example of a polar ring galaxy couldn’t have been found in the original Galaxy Zoo or Galaxy Zoo 2, because it only made it into the Sloan Digital Sky Survey when the sky coverage was extended. It takes a special kind of galaxy crash to make a collisional ring, and you can see this one in progress. It reminded our volunteers and scientists of the Cartwheel galaxy, another spectacular example of these snapshots of a brief moment in time. Well, this is odd. This galaxy looks like it’s on its own, but it has a rather unusual shape that would usually imply some sort of interaction or collision. Our volunteers discussed what could be causing it – until they viewed a zoomed-out image and it became clear that this galaxy has recently flown by a trio of galaxies, which would be more than enough to disrupt it into this lovely shape. When a new batch of data taken by the Hubble Space Telescope appeared on the latest Galaxy Zoo, this was one of the first stunners remarked on by several people. Some of the parts of the sky covered by Hubble coincide with the Sloan Digital Sky Survey, and we linked the surveys up via Talk. Our tireless volunteers launched a thread collecting side-by-side images from SDSS and Hubble, showcasing the power of the world’s greatest space telescope. Hubble’s primary mirror is about the same size as that used by the SDSS, so the differences between the images of the same galaxy are due to the blurring effect of the atmosphere. SDSS (on Earth) at left, HST (in space) at right. It’s always the galaxies you least expect. Okay, okay… If you saw this and said it looks like there isn’t a lot to talk about here, I wouldn’t blame you. 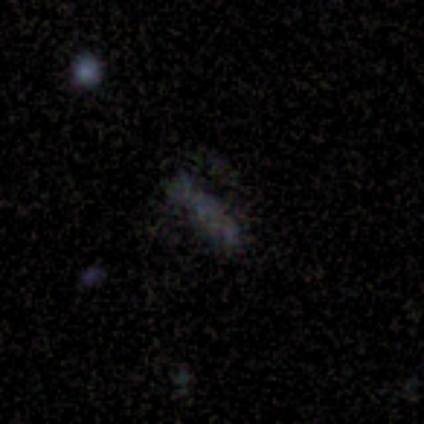 And, indeed, there’s only one “short” comment from one of our volunteers, who used our Examine tools and discovered that this little blotch appears to be a very high-redshift galaxy. However, that same volunteer also started a discussion with the question: just for fun, what’s the highest redshift you’ve found? Others responded, and thus began a quest to find the galaxy in Galaxy Zoo that is the farthest distance from us. This discussion is Galaxy Zoo at its finest, with new and experienced volunteers using the project as inspiration for their own investigations, scouring the scientific literature, and learning about the very early Universe. 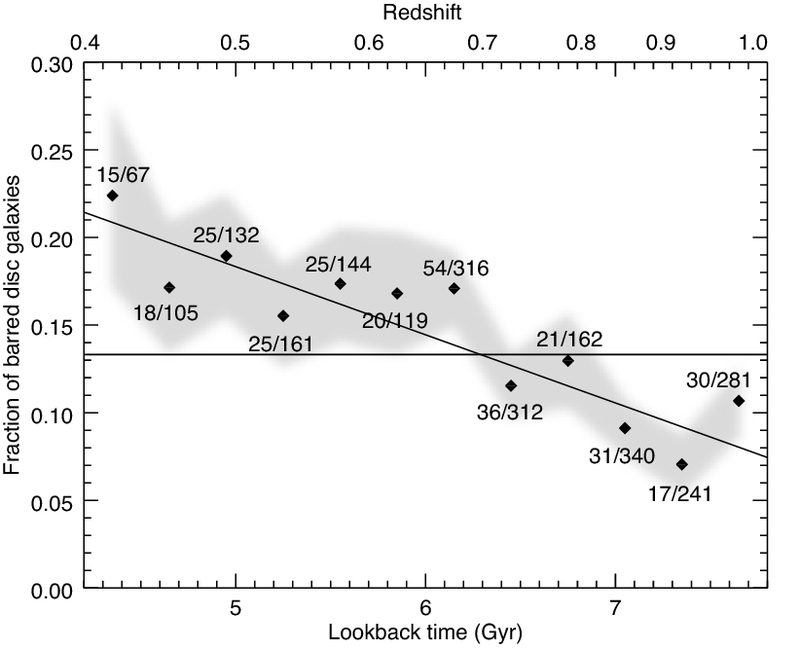 It seems like the most likely known candidate so far is a quasar at a redshift of about 5.5 (at which point the Universe was about 1 billion years old), or, if you don’t think a quasar counts, an extended galaxy at z = 4 or so (1.5 billion years old). But there’s just so much science wonderfulness here, all of it from our fantastic volunteers, and it all started with a patchy blob and a sense of curiosity. Galaxy Zoo started with a million blobs (ish) and a sense of adventure. I think that’s fitting. It’s a week until the 8th anniversary of the launch of Galaxy Zoo. 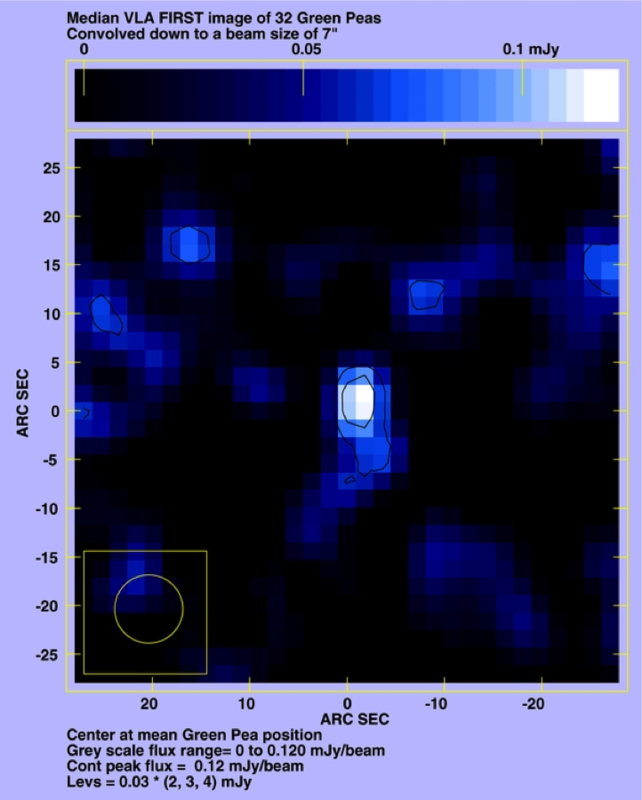 The Hubble Space Telescope observations of giant ionized Voorwerpje clouds near galaxies with active nuclei, many found for the first time though the effort of Galaxy Zoo participants gives us another 8 – one at the end of a long road of numbers. 16,000 galaxies with known or possible active nuclei, 200 highly-ranked cloud candidates based on input from 185 participants, 50 spectroscopic observations, 19 giant ionized clouds, among which we found 8 with evidence that the nucleus has faded dramatically (and then observed by one Hubble Space Telescope). (You wondered where the numeral 8 would come in by now… and there is another one hidden below.) The first batch of scientific results from analysis of these images was described here, and the NASA/ESA press release with beautiful visualizations of the multi-filter image data can be seen here. As a visual summary, here are the images, with starlight and emission from [O III] and H-alpha shown in roughly true visual color. This project was an outgrowth of the discovery of Hanny’s Voorwerp, which remains probably the signature discovery of Galaxy Zoo. In astronomy, one is a pet rock, ten is a statistically valid sample – so we wanted to know more about how common such clouds might be, and what they could tell us about quasars more generally. Zoo participants answered this challenge magnificently. The scientific interest in these objects and their history remains intense, and observations continue. I’ve recently finished processing integral-field spectra from the 8-meter Gemini-North telescope, where we have spectra at every point in a small field of view near the nucleus, and just recently we learned that our proposal for spectra in a few key areas at the high resolution of the Hubble telescope has been approved for the coming year. Even (or especially) for kinds of objects behind its original statistical goals, Galaxy Zoo has provided an amazing ride these last 8 years. Stay with us – and if you see weirdly colored clouds around galaxies, feel free to flag them in Talk!